Banganpalli mangoes on a tree. Banganpalli mango is the most famous mango that is grown in the different regions of Andhra Pradesh- Rajamundry, Hyderabad, Guntur, Chitoor and Kadapa. It is also very popular in Tamil Nadu and Karnataka. 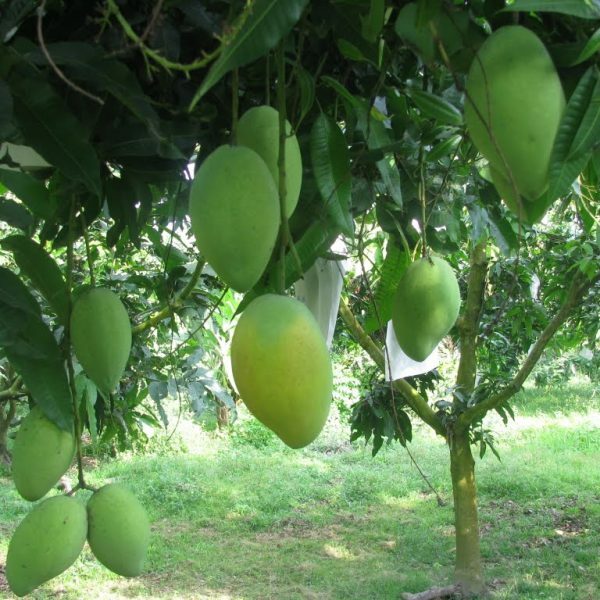 Close variants of the mango are grown all over India, including Gujarat and North India. Banganpalli mango gets its name from the Banganpalli village in Andhra Pradesh, where this variety was first grown. It is also called Banganpalle, Banginpalli, Banaganapalle, Benishan, Baneshan, Chappatai or Safeda. In some places, Safeda or Chappatai are slight variants of the fruit, in others, it is the original version. 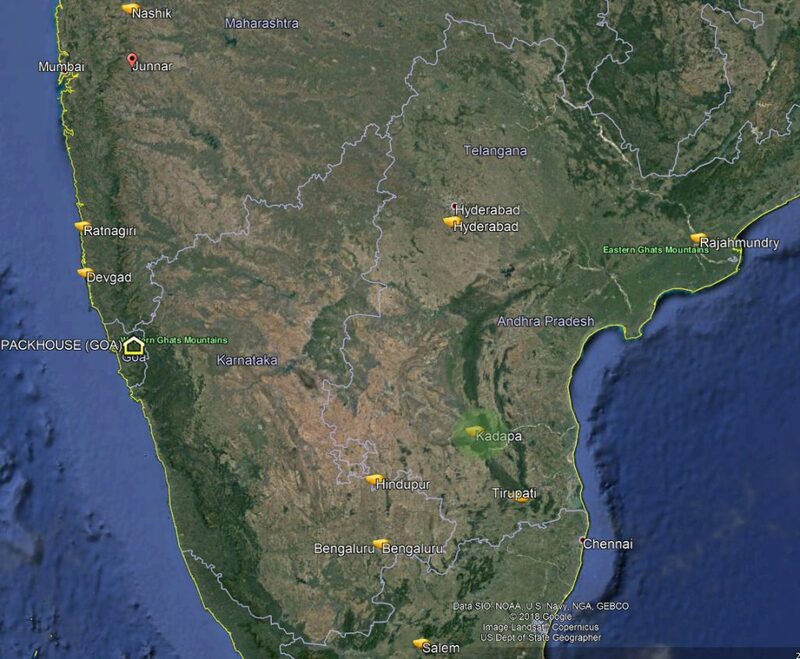 The word Banganpalli is made from two words- Bangan meaning ‘Garden or orchard’ and Phali meaning ‘fruit’. In 2017, Banganpalli got a Geographical Indication to exclusively refer to the fruit grown in Andhra Pradesh as ‘Banganappalle Mangoes of Andhra Pradesh’. Andhra Pradesh exports a lot of Banganpalli mango each year- more than 5500 Tonnes of the fruit is being exported to US and UK. What is so special about the Banganpalli Mango? What is special about the Kadapa Banganpalli mango? Likely the consumers- this is the most sought after mango variety every summer!! People grow Alphonso elsewhere in India (and now abroad as well) and they claim that their Alphonso is no less. However, the mango grown in Ratnagiri and Devgad is different in taste and flavor. Complex in flavor, it is high in trace elements that define mango taste. Once consumed, it becomes the gold standard for comparison. In our experience, this Alphonso mango exhibits the full mango taste profile like none other. Another reason why Alphonso is king is because it throws tantrums like none other if it is not treated well- in this regard the Alphonso from Ratnagiri and Devgad is many notches above the rest!! Extremely sensitive in nature, it can spoil quickly. In terms of sales, Ratnagiri/Devgad Alphonso mango is certainly on the top. What is the season for this mango? Generally, the fruit is ready in May in some regions and June in others. However in 2019, due to the weather, it is expected to be ready in April and last through mid to end of June. In Kadapa, it is expected to start 3rd week of April and last till mid to end June. Generally, the monsoon rains signal the end of the mango. This is because mango that grows after the rains does not have staying power and it deteriorates quickly. How does Banganpalli compare with other mangoes? There is truly no comparison. Each of the top varieties are unique in their own right. Not Just Any Banganpalli- Kadapa/Kurnool Banganpalli! !